Since our previous limit price is lower than today’s one ($57.84 previous day limit) we will keep our previous limit in place. We will not be moving it higher as that would cause us paying more for our shares. If the stock moves higher on Monday, we will probably get executed and buy the stock. If it moves lower, we will continue trailing the price down with the stock. Valero sold off today quite a lot. It is now down -3.84%. If I have bought this stock the first day when I posted this article, showing my strategy of buying a stock in a down market, I would be already sitting on a significant loss. This strategy is now helping me buying cheaper and even more shares than before! Before I could afford buying 16 shares, now I will be able to buy 17 shares of this stock! If the last price of VLO is equal or higher than 57.84 then buy 17 shares of VLO at 57.84 limit. If the last price of VLO is equal or higher than 59.17 then buy 16 shares of VLO at 59.17 limit. In my last post about how to buy stocks in a falling market I described a strategy how to be buying dividend stocks and squeeze as much money as possible out of the trade and take advantage of a falling price. Some dividend investors do not care and buy stocks right away when they can, but I like to play with it and wait for the stock price to get to the level I want. Sometimes you buy a stock and as soon as you buy the stock starts falling. Many times it goes so low that you start questioning yourself why you didn’t wait a few days and buy the stock cheaper. Sometimes it is greed which makes you to buy a stock too early. For example, I was greedy to buy Archer-Daniels-Midland Company (ADM) so much that I forget my strategy and bought the stock as soon as I saved my minimum amount for purchasing the stock. 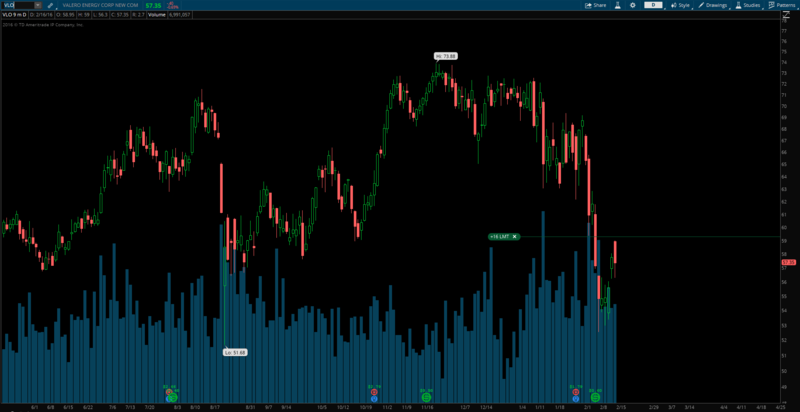 I bought ADM at $37.09 a share. Soon after the stock dropped below $30 a share. You may say that it doesn’t matter. From 25 year investing horizon time we invest for it doesn’t matter if you buy the stock for $37 a share or $31 a share. In the long term it doesn’t make any difference and in 25 years this stock will be way up from today. Well, maybe. Maybe it doesn’t matter to you, but it does matter to me. Why? It’s because of the dividends and limited amount of money available to invest. 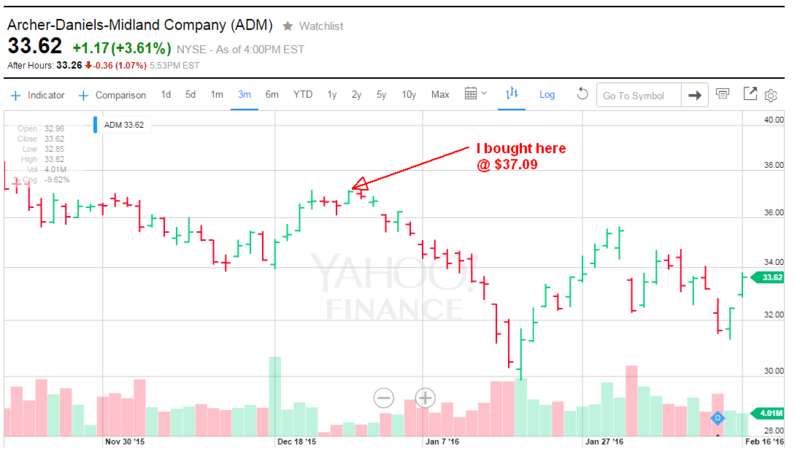 See, I bought 27 shares of ADM only when I was buying at $37.09 with my $1,000 saved amount money. If I wasn’t greedy and tracked the price down, I could buy 32 shares at $31 a share. That is 5 shares difference and those 5 shares could bring in $1.5 dollars more in dividends. Instead of receiving $8.10 dollars in dividends every quarter, I could have $9.6 dollars in dividends. And that is a significant difference to me. Since I am reinvesting dividends using DRIP, I could buy more shares too. My investment could be growing faster! Do you see my point? 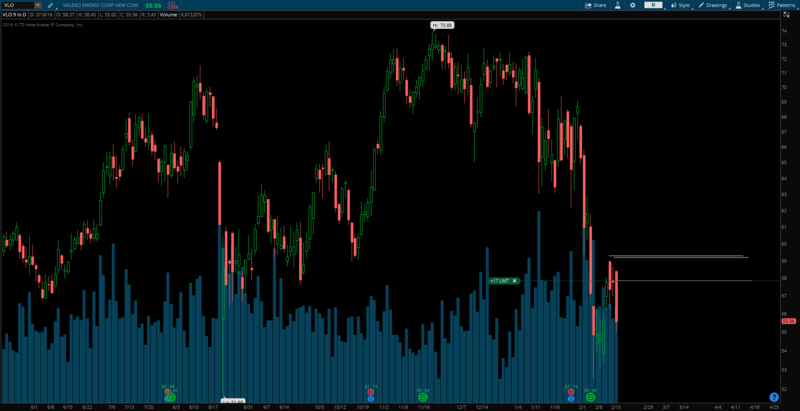 I am not going to make the same mistake with my new purchase – Valero (VLO). Although this strategy is not bullet proof, it still can help you to buy the stock cheaper. Of course, you can get filled into the stock on a reversal and yet later the on the stock may reverse and continue down again. If that happens, I am still OK with this strategy knowing I have done all I could do to buy as cheap as possible. 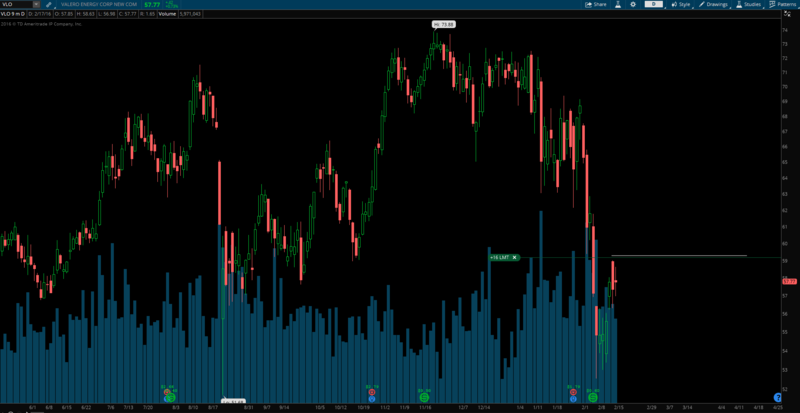 And here is a reason why I am now going to use this strategy to buy into VLO. 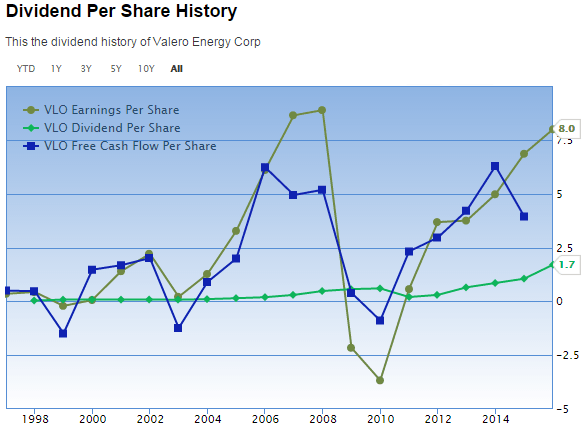 Valero is a dividend growth company. It is refining conventional gasolines, distillates, jet fuel, asphalt, petrochemicals, lubricants, and other refined products as well as a slate of premium products including CBOB and RBOB, gasoline meeting the specifications of the California Air Resources Board (CARB), CARB diesel fuel, and low-sulfur and ultra-low-sulfur diesel fuel. 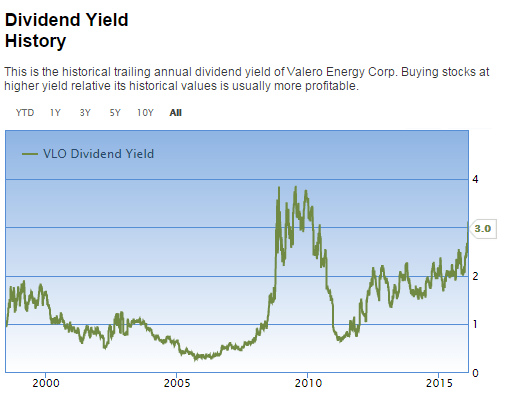 As I said, Valero (VLO) is a dividend growth company. It has been growing dividends for 5 consecutive years. The dividend yield, growth, payout ratio, and YOC5 are great. There is only one issue that in 2010 the company seems to cut the dividend. But since then it is recovering and increasing the dividend every year. Recently VLO increased the dividend by 7%, which is impressive. The stock is now dragged down by market panic and selloff, also oil glut has impact on the stock price as it recently sold of too along with the oil price. As usually, the stock is going down with oil because of lame investors misunderstanding the stock and its business. Valero is a refinery company and it benefits from low oil prices and per Carl Larry, head of oil and gas for Frost & Sullivan LP in Houston, it is a best bet to be in refinery stocks these days. “They have the luxury of low crude feedstock prices and high demand for their products,” he added. The longer the prices of oil stay at the lows, the more the refinery companies will benefit from it. 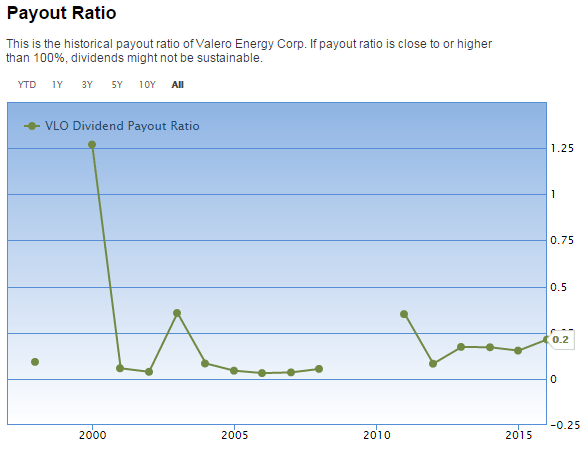 There is one more thing I like about Valero: its P/E and PEG. The P/E today is at 7.25 which compared to 8.80 P/E of the industry indicates a good growth potential. The PEG is at 0.19 which is excellent (0.88 industry PEG). 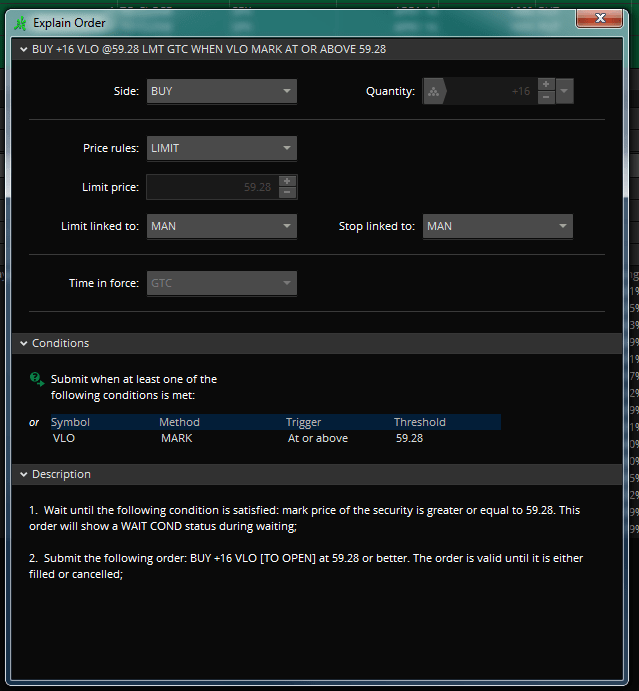 If you read my previous post about OTO order you know that I created a spreadsheet which helps me to calculate the entry price for the stock and then trace the pride down with the stock. Note the order wording at the bottom of the picture above (If the stock price is at or above $59.28 then buy 16 shares of VLO at 59.28 limit price). Let’s see what happens tomorrow. If the stock continues lower tomorrow and in the following days, I will be tracking my buy order lower and lower as long as the price reverses, the price hits my buy limits and I buy the stock. I will be updating this post with the new orders until the stock is purchased. Once the stock is purchased, I will use DRIP to reinvest dividends.